The Americans got the better end of the deal as far as the album title goes. Killing Machine may be a harder, tougher sounding-title, but Hell Bent for Leather fits in far better with the band’s image and style. There’s a lust for leather evident in several of the songs here, tying the whole package up well with that wonderful cover art, a stylized figure with futuristic explosions reflected in those effortlessly cool shades. And, of course, the music, a collection of killer songs that’s not quite up there with Stained Class (what is?) that nonetheless holds up extremely well thirty-five years later. Really, you could have named the album after any of the songs present, not least the excellent opener Delivering The Goods, warming up with staggered riffing before launching into high-quality rocking, quality that never lets up. Burning Up is one of those killer Priest songs that always seems to get overlooked when discussing the band’s best, opening with eerie electronic effects before the rock suddenly slides in, mid-paced crunch topped with Halford’s infectious pleas in the verse, the percussive change in the catchy chorus alone sheer genius. The song changes partway through, taking on a proggier style and jazzing things up before returning to that killer chorus. And whether your version of the album has the band’s cover of The Green Manalishi (With the Two-Pronged Crown) or Killing Machine, or both, you’re guaranteed excellent songs, the former turning Fleetwood Mac’s eerie classic rocker into a solid, crunching metal anthem, the latter a slow-burning chugger that matches the casual threat of the lyrics. To be honest, the only place that this album lets me down at all is Take on the World, which although a forerunner to the likes of United seems a bit out-of-place and awkward to me. There’s no denying that it works as it’s supposed to though, those initial lines of ‘you’ve got to leave your seat, you’ve gotta get up upon your feet’ having the intended stirring feeling, and Halford’s semi-growl quite the change from what we’re used to hearing from him. Elsewhere, even tearsome ballad Before the Dawn works for what it is, and fantastic closer Evil Fantasies, where Halford seems to be trying to mimic an over-enthusiastic soul singer, is just the perfect, highly sexual ending to a great album, building up to something cannily similar to classic Led Zeppelin. 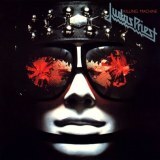 It’s a worthy comparison, in my view; Judas Priest may be most famous for their 80s output, but it’s always worth reminding yourself just how bloody good they were in the 70s, and although Killing Machine / Hell Bent for Leather wasn’t their best album in that decade, it’s still a solid, gleaming, studded metal classic.